With race day approaching quickly this briefing will cover a large amount of information. Please read through it carefully and let us know if you have any questions so you and your team are fully prepared and ready to have an incredible experience when you hit the pavement! These two Bonfyre groups will be the main form of communication between your team and our Race HQ. If you have not yet downloaded the app go to our app website by clicking HERE and get it now. If you did not receive, or you need us to resend, your two Bonfyre invite links please contact our team at XTeam@XperienceAdventures.com and we will get them to you. Then read carefully through our app website and use the tips we've provided to become a pro at using the app before you hit the pavement. It's a very simple and intuitive app but if you aren't sure how to comment and submit pictures and video into your Team Bonfyre before the race begins it will slow your team down greatly. You will be receiving a text message from our Race HQ (Headquarters) in the near future that will ask you to join our race texting service. This will be a temporary list you will join for the race only and we will remove you from it after the weekend. It will solely be used as a way to communicate efficiently with you as needed. For example, if there are weather or safety concerns in the city, or if the Bonfyre App is down for some reason and we need a backup technology in place. Once you receive the text, you'll need to respond "YES" in order to join the list. You will then receive an automated text welcoming you to the service which you don't need to respond to. * If you don't receive the text for some reason it's not a problem. As long as one person on your team joins then your team will be in good shape. We will not use it for any clues, just in case of emergency. Most races will give you a paper clue sheet when the race starts with all the locations to get to, or challenges to complete. Our clues will be on a hidden website. To get "access" to that website there will be a location somewhere in the city that will have the info you need to figure out the website. If you're able to narrow down the possible location of the Access using the radius clues below (they were also posted in your Team Bonfyre) then you could potentially gain a decent advantage right as the race begins. Here's a secret tip....the Access will not necessarily be directly between these two points, or even right near either of them, but rather somewhere in the converging area where the 1 Mile and Half Mile radius circles overlap. Figure that area out and you'll give your team a big advantage as the race starts. Using the example below (which is not for your city) you would want to start your team somewhere in the area where the two overlap. If the Access were something you had to find near Independence Hall you would already be close to it as the race began. If you can only figure out one of the clues then start your team somewhere strategic within that radius and you'll still be in a good position to get to the Access quickly at the start. This example (which is not for your city) shows the area where the two clues overlap. You can be certain the Access will be somewhere in that area for your race! When you registered, you assigned yourself a 3-digit race bib number which you will use to identify yourself on race day. If you forget what number you assigned yourself you can log into your Eventbrite account and click on "View Order" and then scroll down to see the number you chose. If you can't find it for some reason you can let us know by commenting in your Team Bonfyre and we'll confirm it for you. For race day identification we are now using the preferred method of most triathlons and adventure races called "Body Marking". Body Marking, or having your bib number displayed on yourself, is a durable and effective way to let everyone around you know you're in the middle of a fun and competitive race through the city, without having to wear a paper bib and safety pins. There are endless types of durable markers that will do the job, from the standard Sharpie found in your junk drawer, to those specifically for races like this, found at running stores and sporting goods locations. No matter what option you go with, all are safe and can be removed after the race using a variety of methods. Some simple ways of removing your body markings are detailed HERE. 1. Simply write the word "XPLORE" somewhere highly visible on your body or exterior layer of clothing. 2. Write the 3-digit Race Bib Number that you registered with, somewhere highly visible on your body or exterior layer of clothing. * The word "XPLORE" and your 3-digit Race Bib Number need to be visible at all times, clearly written, and large enough that you can easily be identified by on-course volunteers, partnering businesses, and our remote Race HQ. * If you prefer to not write on your body you can simply write the two required pieces of information on any exterior layer of clothing, headbands, hats, costumes, etc. Be creative and have fun looking like the true adventure racer you are! An example of racers displaying their body markings on their forearms and shoulders so it's visible when they "flash the X"
Depending on the route you end up taking throughout the day and how much public transit you end up using, a team that finishes the race will have probably covered at least 6 urban miles. You should be aware of the weather conditions and temperatures (see our weather section below for an updated forecast) and plan accordingly with clothing, water, snacks, sunscreen, and any personal items you'll need for an approximately 2-4 hour race. Xplore is a high-tech race, where teams will be required to take pictures and/or video with a mobile device, utilize the internet, mobile apps, text messaging, and possibly email during the race if needed. Make sure at least one of your team members (and hopefully more) will have a device that can utilize these functions. It is strongly recommended that team members bring, and possibly race with, the power cord for your mobile device. In any urban race you can expect to use a lot of your device's power throughout the course of the race, and having a charger may be the difference between being able to finish the race, or running out of power somewhere along the way. A map of the city, pen or pencil, something to take notes on, and a good understanding of the city will give your team a huge advantage. You should probably carry your ID for emergency purposes but we will not need it as long as you properly registered. You should also have some cash on you during the race for any water or snacks you choose to buy along the way, in case you did not purchase a public transit pass in advance and suddenly decide you would like to use one, or in case a checkpoint requires your team to purchase a small item. 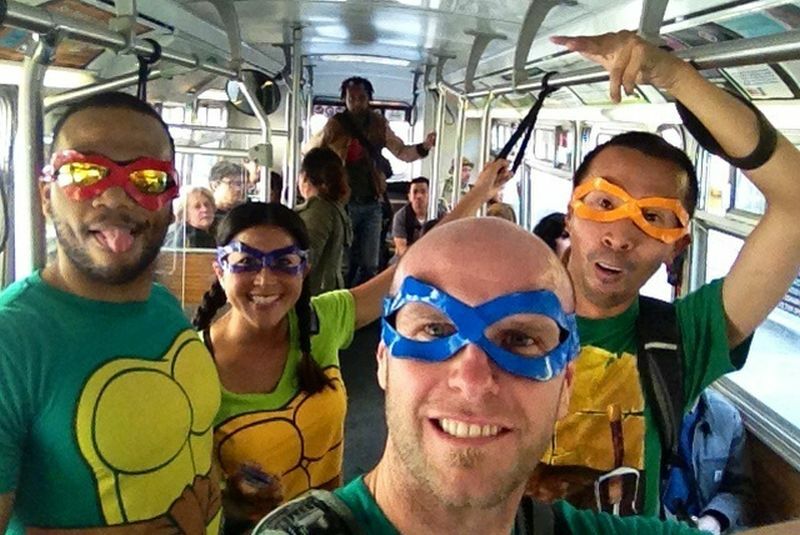 Wild costumes or matching team outfits are always encouraged and are guaranteed to improve team comradery! Most importantly, bring a sense of adventure, and plan to walk away with more great memories than you came with. The conditions for Saturday's Xplore race are looking much cooler than the recent oppressive heat. There is a slight chance for a brief passing shower during the day (most likely will be north of Seattle), but it is generally looking like a nice day to be racing around the city compared to the recent heat wave. Race time temperatures are expected to be right around 70 degrees. We suggest keeping some extra clothes in your car or your bag in case you get sweaty or wet during the race and want to wear something dry while hanging out at the post-race venue. For more details click on the button below. People- in most situations you will be moving faster than those around you so be kind and mindful of others throughout the race. Weather- the conditions can change in an instant so be prepared in advance and be prepared to adjust your plans if the weather creates an unsafe situation. The race will rarely be postponed or cancelled due to weather before or during the race so make safety your top priority and seek shelter, take a break, or wait it out if needed and live to run another day. If we notice a possibly dangerous weather situation developing we will do our best to notify your team via the Bonfyre or texting service. Health- the race will be highly physical so be sure to hydrate sufficiently and eat properly in the days leading up to the race, while you're racing, and as you recover. If you need a break during the race, take it, as long of a break as you need. If you feel like you're having a medical emergency, get injured, or become ill please take the necessary steps to seek professional medical assistance, including dialing 911 if needed. Post pictures and video of your team getting pumped up and ready to race in the Race Bonfyre! It's a social and fun way of seeing the teams you'll be racing against, and hanging out with after you cross the finish line! We'll also be sharing a lot of the content via our own social networks and putting it on our website so have some fun! Leading up to the start we'll be posting in the Race Bonfyre at various increments to let you know any last minute info and giving you an official countdown to the start! Right at the start of the race we will send out the final Access Clue. For more details on this, see the content at the top of this briefing. Once the race begins all of your correspondences and submissions should be done through your TEAM BONFYRE. This is very important since the Team Bonfyre only includes racers on your own team and our Race HQ. Once you have access to the clue website you will most likely work on solving the clues to figure out the checkpoint locations and the challenges you need to complete. Read each clue carefully and complete each checkpoint accurately based on the description. You must complete 9 out of the 10 checkpoints. Checkpoint #10 is mandatory (cannot be your skip), and will need to be completed last, otherwise checkpoints can be completed in any order throughout the race. The two big components of Urban Racing strategy usually come down to "which checkpoint should we skip" and "what's the fastest and most efficient method of travel and the most efficient route to get from one checkpoint to another". Some checkpoints will be further away but may be easier to complete once there, and others may be closer or something you can do along the way but could be harder to complete. These are all things you'll probably be constantly thinking about throughout the day. We've found that racers appreciate these validation points so they can quickly and easily reference what is needed in the submission in order for it to be verified by our HQ. If you review them right as you arrive at a checkpoint or just before completing the challenge you will likely do everything needed for the submission and you will save your team a ton of time throughout the course of the race. Our HQ will review your submission almost instantly. You should see your response very quickly but you do not need to wait around for it, especially if you are confident that you completed the checkpoint correctly. There is typically no limit to the number of submissions you can send HQ in order to get it verified, unless otherwise noted for a specific clue. Teams need to stay together throughout the race from one checkpoint to another and each team member (and their body markings when possible) should be visible in every submission unless otherwise noted. The only time team members are typically able to split up momentarily is if you all get to a checkpoint and it requires you to search for something. For example, you all get to a sculpture garden and you need to find a specific statue. You can split up within the garden to find the statue and then will need to regroup to take the picture. During the race your team is only allowed to travel on your own physical ability (legs, wheelchair, stroller, etc) or on public transportation such as Buses, Light Rail, Subway, Tram/Trolley, etc. You are not allowed to take private, personal, or community "shared" transportation including Taxi, Bikes, Pedicab, Horse-Drawn Carriage, Sight-Seeing Tours, Private Vehicle, Skateboards, Rollerblades, BikeShare and CarShare programs, etc. Any use of these will most likely be documented by another team or an undercover staff member and you will be immediately disqualified from the race. If you have a race-related question during the race you can submit it through your Team Bonfyre. We will do everything we can to respond quickly and provide you with the information you need as long as it doesn't impact your ability to solve the clue. We will be keeping track of the number of checkpoints every team has completed throughout the race, in real-time. It is a good idea though to be keeping track for yourself so you know which checkpoints you've completed and which ones you still need to complete. Once you've completed 8 total you will head to the checkpoint listed as Checkpoint #10 on your clue website and we will send you a very brief instruction on what to do there. This location will be the Finish Line for the entire race, and sending instructions on what to do there after you've completed 8 total will prevent any teams from trying to complete it earlier in the race and then just submit it at the end. It has become a tradition that at somepoint during the race you will most likely be required to "Flash The X". This is a simple pose where you cross your forearms in front of your body to form an "X". We cannot say if, or when, this will be required in your race but you should be aware of the term and know the pose if it's required of you. It's time to celebrate a great day, a tough workout, and fun times with friends, by hitting the after-race venue! The location of the venue will be listed on your clue website and there will likely be drink and food specials waiting for you. Get there quickly so you can see some of the other team's faces when they arrive and realize you've been there celebrating while they were still out on the course. Although we love to party, please be aware that our staff may not be at the after-race venue. Our Race Headquarters will be busy verifying teams throughout the day. The venue gives your team a chance to relax, meet some other teams, and celebrate a great day together. While you're hanging out at the venue be sure to take pictures and video of your team with other racers and post it to the Race Bonfyre so everyone can enjoy it, and we can share it across our social networks. There is no limit to how much the prizes can grow so as our company continues to grow and the size of our races grow, so will the amount of money that can be won. Official company checks will be mailed to the top 3 finishing teams on the first business day after the race and will arrive directly to them within a few days. 1. An exclusive partnership with the soon to be released Paramount Pictures movie called "Hercules", starring "The Rock" (Dwayne Johnson). All Racers: Receive advanced screening tickets to the movie to see it this coming week (won't be released to the public until late July). Seating is on a first come first serve basis at the theater so be sure to get there early. Top 5 Teams: Receive an official movie poster in addition to the advanced screening tickets. Top 3 Teams: Each receive 2 VIP advanced screening passes to the movie, and the official movie poster. 2. Prize packs from our sponsor ENERGYbits for the top teams. Top 3 Teams: Each receive a prize pack full of the natural ENERGYbits product. To get your own supply of ENERGYbits at a discounted price you can purchase them at www.energybits.com and use the code "XploreRace" to get 15% OFF! Teams that finish in the Top 10 will be recognized on our leaderboard website (click HERE), which is constantly visited by racers and teams from across the country. We will honor you by having a team picture and your official finishing position on our website for the entire 2014 season. Teams that finish in the Top 25 will receive points toward the season-long leaderboard. This is the only leaderboard of it's kind in the Urban Adventure Racing industry and is featured prominently on our website. More importantly, you will be in the hunt for the X-Prize, which is a growing cash prize (based on total registered racers throughout the entire season) that gets awarded to the team at the top of the leaderboard at the end of the 2014 season! Last year, Ed Wagner (Captain) and his team called "Clubedventures" took home the coveted prize and the title of Xplore Champion. If you've read this far in the briefing you deserve a clue for your race (the access will be along 4th Ave in Belltown). The team that wins the X-Prize will receive the large prize money, will have an end of the season interview featured on our website and social networks, and will have the pride in knowing you were better than hundreds of other teams across the country! We have carefully scouted and vetted every checkpoint in this race, however cities are a constantly changing beast, so if a checkpoint is inaccessible or you're not able to complete the requirements for any reason let us know right away and we will adjust the requirements if needed and verify accordingly. Our new mobile racing model is somewhat dependent on the functionality of a number of technology platforms. We do have backup plans in place for every possible scenario we can think of, but we won't go over all of them in the briefing and take up your time unless they become necessary. Just be aware that it will most likely consist of a combination of platforms and social networks in order to submit your clues. We expect the race and all of our technology to be very smooth and provide you with an incredible experience but we just wanted to include this information in the briefing in case we need to implement a backup plan for any reason. Have fun! Get active! Experience your city in a unique way! And take some really great pictures and video so you can remember this for a long time to come!